The battle between Torre de Manila and those who were opposed to its construction has entered the round 2; legal battle. Both sides have entered their dispositions and both claimed have legal victories. From the looks of it, it seems that DMCI construction will win the battle if we based it on the opinion of one of the Supreme Court justices SC Justice Antonio Carpio. He stated that if there is no law barring DMCI from constructing behind a monument, what is stopping them from construction? This opinion, clearly from the point of view of legalese, renders everything moot and academic. Due process is no longer the issue here but compromise. 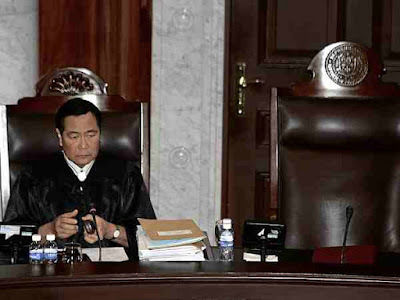 Compromise will save everyone's faces from the Knights of Rizal members, to the National Commission for Culture and the Arts commissioners, and to both local government officials and DMCI people who made judgmental errors from the approval of construction up to this moment. Declare it a national issue and resolve it through a plebiscite. Since Filipinos tend to look for complicated solutions, why not go for it? It only needs police power to stop the construction or tear down the walls as well. But the government as usual lack the gall and balls to do it. Probably, because it involves a rich man’s property; thus, the hesitancy to touch the issue directly. Had it been a squatter problem, bulldozers would have attacked the perimeter in seconds. Since election is near, why not let the whole country decide Torre de Manila’s fate? Build a great wall of the Philippines. 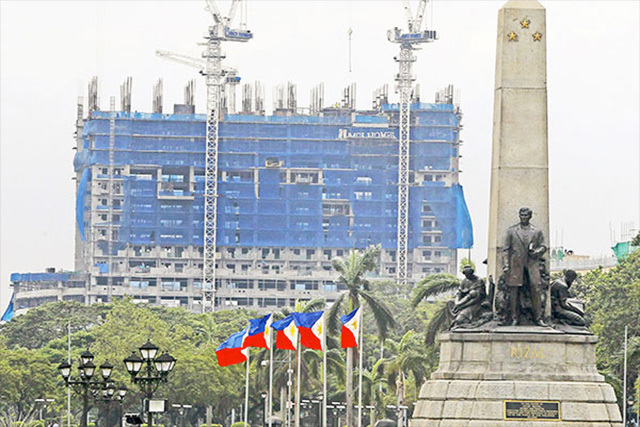 If China has a Great Wall to protect ancient Chinese from Mongolian invaders, why not build a giant tarpaulin to protect Filipinos from “diluted” skyline and let their eyes feast on Rizal monument exclusively? This compromise will not only help resolve the issue and save everyone’s faces but this is another Pinoy record for the Guinness Book of World Record. Make the Photoshop image a reality. 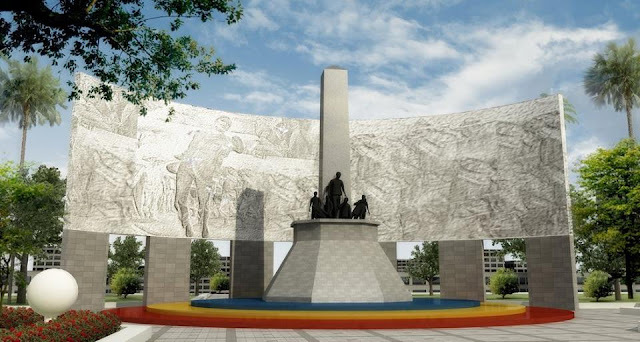 Before the legal battle started, there was an image shared by many Filipinos on what should be done with Rizal’s monument in order not be overshadowed by Torre de Manila. The image showed Rizal monument cut from the ground and pasted on top of Torre de Manila Tower. While this is funny, there is a hint of relevancy about this image when you talk of compromise and solution. It is logical, isn’t it? Image credit: When in Manila where more Photoshop based solutions on how to solve the problem are posted. DMCI structure towers Rizal monument and this is a huge disrespect with our National Hero. 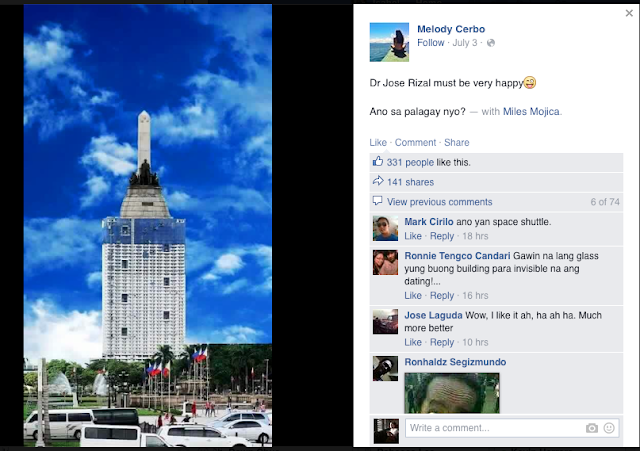 If this is the case, why not build a Rizal monument as big as Torre de Manila if size is the issue? Involve all those who are in favor of dismantling Torre de Manila and encourage them to fund and build a giant Rizal monument as a compromise. Or why not let DCMI fund and build a giant Rizal monument as compensation for building a sight for sore eyes? 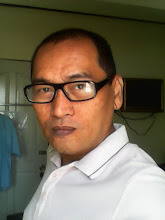 The problem with Luneta and Torre de Manila issue is not about politics. It is not about Rizal and his legacy and it is not about DMCI's loss either if the building is torn down. It is about a lack of nationalistic idealism. The City of Manila officials did not have a strong nationalistic idealism embedded with them when they decided to approve the construction. The DMCI people did not care about national heritage when they decided to build a tower. This lack of strong nationalistic fervor is the real problem. The solution therefore is to learn from this incident and identify how similar situations in the future can be avoided. It takes time to build nationalist fervor and probably too late already. Thus, the government should identify local heritage and create laws that will protect them (if there are none yet) or give existing heritage laws more teeth to avoid this kind of situation in the future. Second, the government should inform the whole citizenry about heritage laws and the list of protected heritage sites through advertising and use of social network. Other than the lack of national fervor, ignorance is the second reason why the Thrilla in Luneta versus Torre de Manila existed. Nota Bene: This is a continuation of a previous article on a similar topic and you can read it on this link.